There is another week of mixed fixtures ahead in South football with South of Scotland League matches and cup matches being played. On Friday evening there is a Potts Cup second round match when Lochar Thistle play Queen of the South at Palmerston Park for what should be a close and exciting match between two fairly evenly matched sides. The Potts Cup continues on Saturday with another three ties being played. 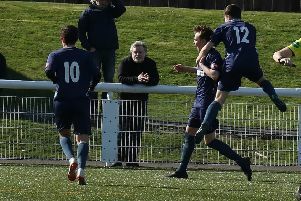 High flying Heston Rovers play an in form Nithsdale Wanderers while home advantage for St Cuthbert Wanderers in their match against Abbey Vale could well see the Kirkcudbright side progress. Threave Rovers and Newton Stewart clash at Meadow Park where again home advantage may be the deciding factor although the Castle Douglas side may well have to be at their very best to see off the challenge from the Creesiders. There are three South of Scotland League matches scheduled to be played on the same day with Bonnyton Thistle favourites to take the three points from their match in Kilmarnock against Dumfries YMCA. Lochmaben and Annan Athletic could well share the points while Upper Annandale will start as slight favourites in their match against Creetown. On Sunday afternoon Mid Annandale lock horns with Tynecastle at Herriot Watt University in Edinburgh in the final of this season’s South/East Cup Winners Cup for a contest the East of Scotland side will start as slight favourites to take the silverware. However if the Lockerbie team can produce the form that saw them win the Alba Cup recently then they are more than capable of bringing the Shield back home as they fly the flag for South football. Mids will take the good wishes of everyone involved with South football with them in their endeavours to win the silverware. There are two matches being played on Wednesday evening with Threave Rovers and Newton Stewart playing each other for the second time in a week but this time in the league while Dumfries YMCA entertain Heston Rovers in the semi final of the South League Cup. In this match Heston look favourites to reach the final and a chance of the silverware but YMCA are in the semi final stages by virtue of their never say die attitude and could possibly with a bit of luck record an upset if things go well for them in this encounter.